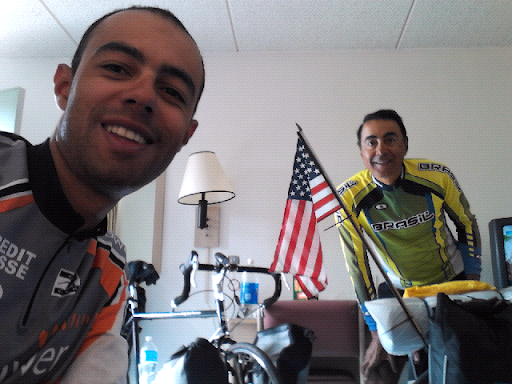 USA on a Bicycle: On our way to Grand Canyon! We're leaving Flagstaff now and are on our way to the Grand Canyon! It will be close to 90 miles of UPS and downs but it road is beautiful and we hope to get there before dusk. Tonight will just set our tents and sleep, then tomorrow we will go out to explore the area. The plan is to spend the day in the Grand Canyon, then watch the sunset and after that ride our bikes back to Williams, AZ. We will probably arrive in Williams around 2:30 in the morning so on the next day will ride a short stretch of 40 miles to a city called Seligman, still in Arizona. That day we will attempt to sleep around 4 pm and then wake up at 3 am to ride at night to the next city called Kingsman. But that's in two days. Today we'll concentrate infinishing these 90 miles to the canyon.